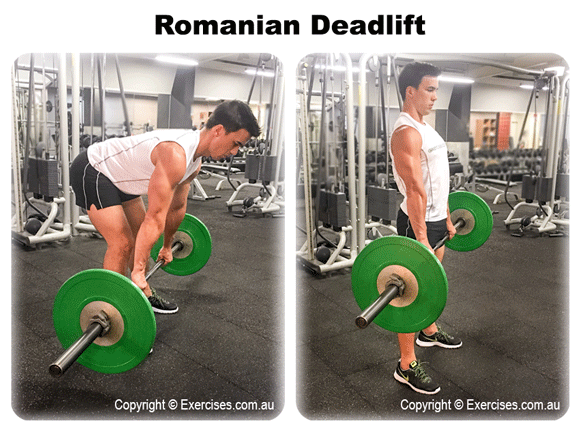 Romanian Deadlift is an effective exercise for working your entire back, traps, shoulders and forearms. But the angle of the lower back and the semi-straight position of the legs shifts more focus on the lower back, gluteus and hamstring muscles. The core muscles are also engaged to stabilise and support the lower back. Romanian Deadlift can improve your overall back strength but it is valuable in developing flexibility in your hip, lower back, glutes and hamstrings. Assume a shoulder width stance with both feet in a neutral position. Pull your shoulders back, tighten your core and maintain a flat back position throughout the exercise. Bend at the hip and bring the bar close to the floor. Your legs must remain lightly bent; keep lowering the bar until your hips are at the same level as your shoulders. You must feel a good stretch on your hamstrings. Bring the bar back up by extending your hips and pushing it forward when the bar goes above your knees. Your arms must remain perfectly straight. Keep the bar close to the body. At the top position, make sure your shoulders are dropped lower. Hold the position for a count of “one”. Resist the weight as you bring the barbell back to starting position. Do not let the bar touch the ground so you can maintain constant tension. The bar must always travel close to the body when doing Romanian Deadlift. Do not allow the bar to drift forward. Keep your back flat; avoid rounding out your lower back. 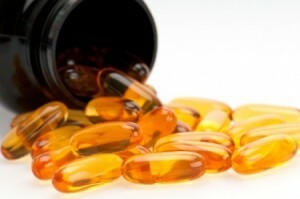 Because of the strong stretch on the hamstrings, it is advisable to use only light or moderately heavy weight.